Now regular readers of this blog (which may be an extinct species since I have only posted a couple times a year recently)… One-time regular readers of this blog would recognise that while I speak about my food experiences and specific dishes, I am not consistent recipe writer. So, please accept this disclaimer. For Eid ul Fitr earlier this year (which was in August), I was in Trinidad with the parents and Lilandra. We didn’t make a tonne of stuff, since we were taking off on a grand family vacation the next day, but we did fix on certain things. Mom made sawine. I mixed up some falafel. We helped Mom make a biriyani, baked in the oven. And during the par-cooking of the rice for the biriyani, the scent of basmati rice, coconut milk and spices made us strongly, urgently, crave some sweet rice. What is sweet rice? It is an Indian sweet, generally made for special occasions, that is also known as kheer (in Guyana, they use the Indian term also). In our village, we tend to get deliveries of sweet rice from certain families when they are celebrating a particular occasion, the way we deliver Sawine for Eid! 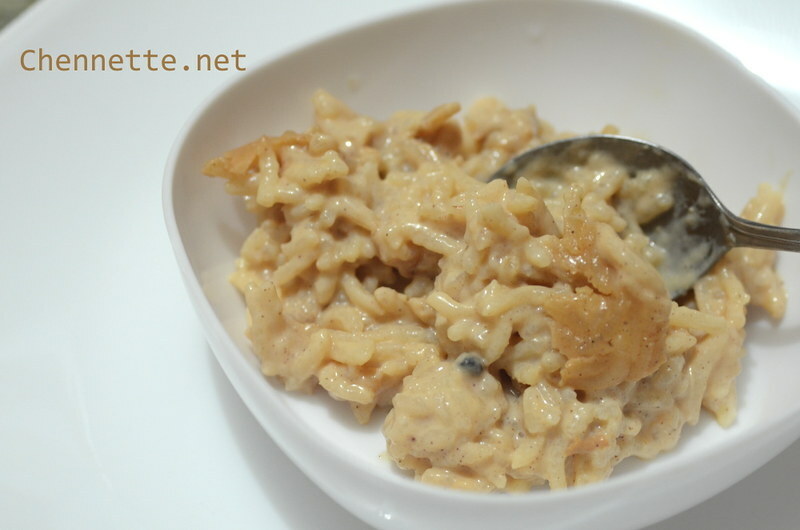 It is like a rice pudding, and can be enjoyed warm or cold. You can make it ginger, or add raisins or nuts like almonds, but it always has at least cloves and cinnamon. It can vary in the amount of liquid in the end result, but the rice must be soft-to-mushy, and sticky. You can see some other Trini sweet rice recipes at Trini Gourmet, Cooking with Ria, or Simply Trini Cooking. This version does not have raisins, or ginger. Basmati Rice, while lovely, retains a certain individuality of texture of the grains no matter the length of cooking. The more usual rice is white rice, so that the end product is traditionally a mushier mixture. However, the basmati sweet rice, with its distinct grains and added flavour, was quite a nice change. Just boil the rice, don’t bother trying to microwave rice for this. Baking the sweet rice resulted in a lovely colour and hint of caramel flavour. Yum. It might be interesting to try this with more coconut milk, or the coconut flavoured milks that are now available. Or putting in bits of coconut. Many recipes use a whole tin of condensed milk, but Mom insisted that only half tin was necessary. It was sweet enough for our taste, but bear that in mind if you want it sweeter, and especially if you want to serve it cold, where increased sweetness might be necessary. So, how did we make this? 1. Put rice, water, salt and spices in a pot. Let soak for at least half hour. 2. Add coconut milk to the pot and boil rice until cooked (but not necessarily mushy). Take off heat. 3. Add evaporated and condensed milks, STIR VERY WELL UNTIL DISSOLVED. Add more water if necessary. 4. Pour rice mixture into a greased oven-safe dish. Cover tightly with foil. Bake in 350 deg C oven (stirring occasionally) until rice soft and liquid mostly absorbed. This entry was written by Chennette and posted on October 28, 2013 at 10:50 am and filed under 'Id, Eid ul Fitr, recipes, Trinidad and Tobago. Bookmark the permalink. Follow any comments here with the RSS feed for this post. Post a comment or leave a trackback: Trackback URL.